Science or sacrilege? Atheists and agnostics are 76% more likely than Christians to believe in the existence of extraterrestrial life. Ever since Copernicus formulated a heliocentric model of the universe in the 16th century, scientific discovery has posed uncomfortable questions for the religious faithful. The modern age is no different, as NASA's Mars rover Curiosity and other evidence suggest the possibility that Earthlings are not alone in the universe — which many find to be at odds with fundamental theological teachings. 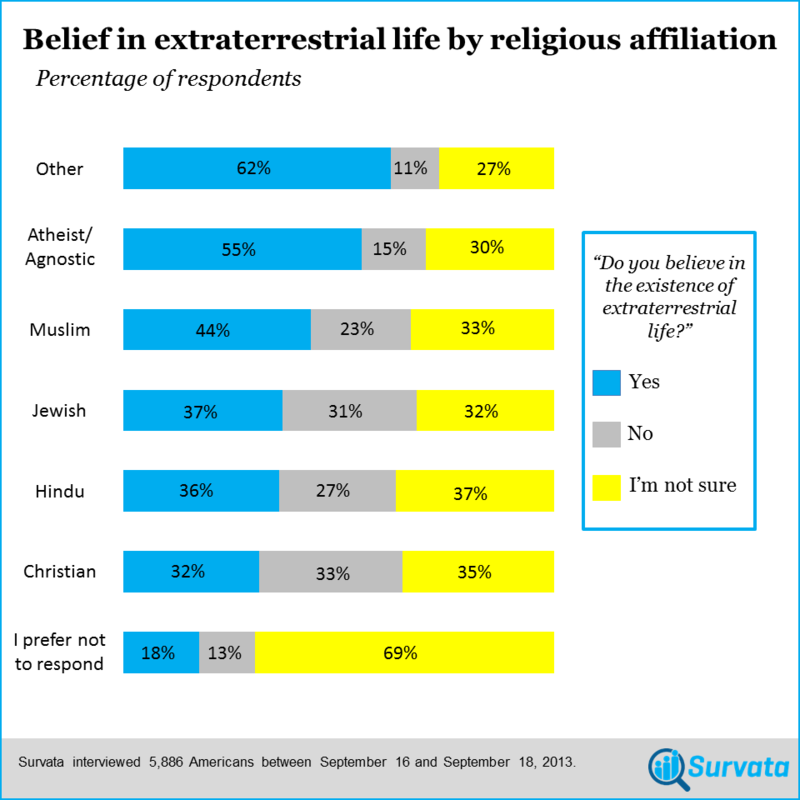 At Survata, we were curious how religious affiliation relates to a belief in extraterrestrial life. To test this, we used our survey system to poll 5,886 Americans. We asked the respondents to state a religious affiliation and then asked "Do you believe in the existence of extraterrestrial life?" 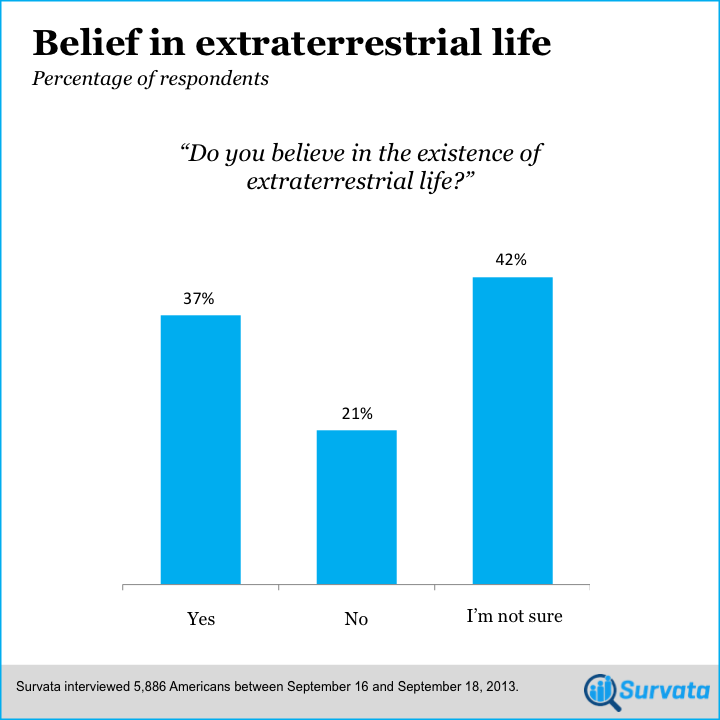 Of the 5,886 Americans polled, 37% affirmed a belief in the existence of extraterrestrial life, 21% denied such a belief, and 42% were uncertain, responding "I'm not sure." 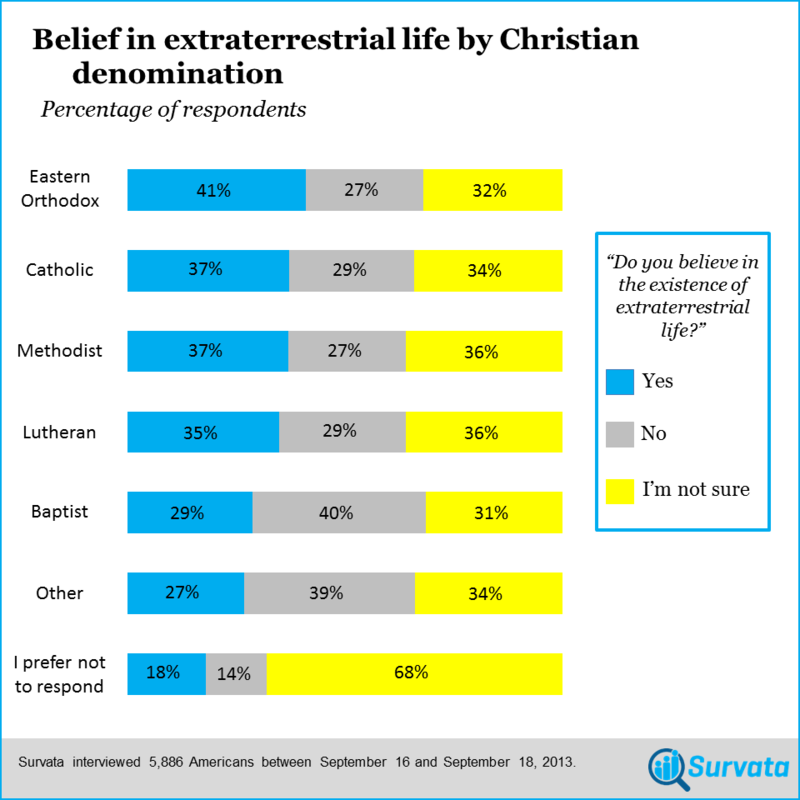 Belief in extraterrestrial life varies dramatically by religious affiliation (or lack thereof). Of those who identify as atheist or agnostic, 55% affirm a belief in extraterrestrial life compared to only 32% of Christians, meaning atheists and agnostics are 76% more likely than Christians to believe in the existence of life beyond our planet. Furthermore, the results suggest that not all Christians think alike when it comes to extraterrestrial life. Among Christian denominations, Baptists (29%) and those selecting "Other" (27%) were found to be the least likely to affirm the existence of life outside our planet. While no earthly poll can provide insight into the contents of our vast universe, our results suggest that the prospect of extraterrestrial life resonates more among nonreligious groups. NASA's Mars rover Curiosity will have to provide some more concrete evidence to convince many Americans. Got a pressing question? Create a Survata survey in minutes. Will Americans trust Al Jazeera? It depends where viewers live, and how they browse the web.